Who experienced G.INP on ECI? Re: Who experienced G.INP on ECI? I think its worth asking those who had a speed increase if they were on fast path beforehand or not. I was keeping a spreadsheet of speed differences. Don't have it to hand for exact stats as it was on another PC - but I did post some excerpts in the eci g.inp thread at the time. It was really only those who previously were interleaved (or more correctly - previously had INP) that got any real speed benefits from G.INP. There were a few who weren't previously interleaved who may have gained a few kbps, but there were also a few that lost some speed. Not sure if thats a red herring or not. The original projected rollout for g.inp on the eci cabs was something like July 2015 (after the Huawei's had been completed). It was only after it was found to be problematic on the Huawei cabs with certain modems that the eci rollout got delayed to the next year. There's been plenty of other technologies rolled out that haven't been restricted to the first 4 months. It may be something to do with their projected roadpaths and plans they have in the pipeline for over the coming year which are planned many months in advance. The fix for the Huaweis was in effect more of a hack by tweaking with the DLM. It may have been more problematic to fix whatever was going wrong with the ECI's - we still dont know exactly what, but it seemed to be affecting the non MCT modems. They may not want to pull devs off some other on going project which could in turn delay that rollout. One of the first set of stats had approximately a 4Mb increase with G.INP over fast path, with a further increase from using a HH5A. The ECI cabinets didn't do G.INP on the upstream, so not change expected for the upstream. @Sunzz Basically G.INP is a form of error correction, and if I've remembered correctly only the packets that are not received correctly are retransmitted, whereas interleaving permanently transmits error correction information to allow damaged packets to be rebuilt so to speak. Because interleaving continuously transmits this information it takes up a chunk of bandwidth, thus reducing your effective speed, when replaced with G.inp the lines performs as if it is on fast path (no interleaving). Please note this is only my basic understanding so may be incorrect regarding terms etc. 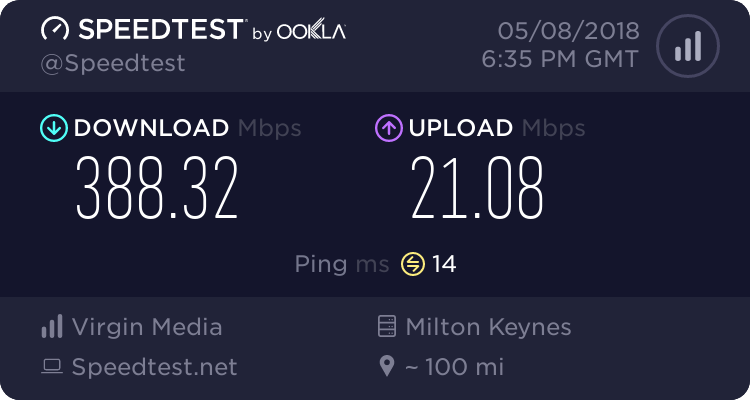 well openreach may also be rolling out 3db profiles this spring, so if g.inp is the difference between getting on that profile or not then it will also translate to a speed increase. Mine was rock solid and very fast with G.INP on, anything but when they turned it off. I had big problems with the download speed as the DLM went nuts. My down speed dropped from well over 80mbps to just 50 - 60mbps with several re-syncs per day. After much arguing with customer services an engineer attended & did a DLM reset which vastly improved things. it's now solid (but at only 74mbps) so I lost about 8% overall. Youare very lucky, my ISP TT flatly refused to get my cap removed because they say I can only gain now 1000kbps despite having 70000kbps with G.INP on ECI. The cap went on to try to fix a bug which it did not but now they wont remove it. So when/if ECI gets G.INP back I'll have a fight all over again.